Wildfires continue to ravage the Canadian province of Alberta, and experts say they could double in size and take months to extinguish. Here are the latest space-based images of this unprecedented natural disaster. Fire crews in Fort McMurray say it’ll be weeks before the city is deemed safe. Wildfires began to spread through the city early last week, destroying nearly 2,500 structures. Mercifully, around 85 percent of the city remains intact, including the hospital, municipal building, hotels, and all its schools. Around 80,000 residents of Fort McMurray were evacuated, of which 40,000 are in Edmonton. Adding insult to injury, a stomach flu is now making the rounds among the evacuees. DigitalGlobe, a provider of hi-res Earth-imagery, provided Gizmodo with these photographs, which were captured by its WorldView-2 and WorldView-3 satellites last week. WorldView-2 “sees” the world in eight spectral bands, four in the visible part of the spectrum, and four in the invisible, near-infrared part of the spectrum. Near-infrared imaging helps scientists understand the health of the vegetation on the ground; in these false-color images, the bright red areas represent healthy forest land. In the “after” images, the burnt-out areas show up as black and gray. The “before” images shown here were taken last year on May 29, 2015. 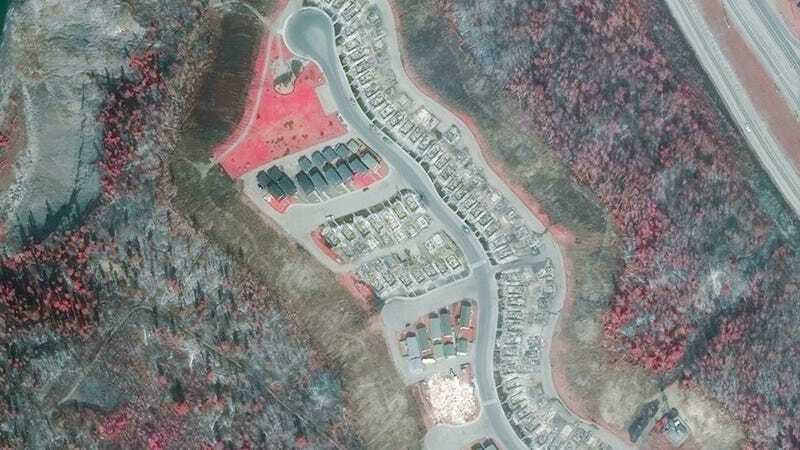 DigitalGlobe also imaged the Fort McMurray area on May 5, 2016, with its WorldView-3 satellite. This satellite has the unique ability to peer through smoke using Shortwave Infrared (SWIR) technology to see where the fire is burning and how intensely it’s burning. In these false-color images, the yellow areas are those that have been burned by the fire, the purple areas are healthy vegetation, and the bright yellow spots are where the fire is actively burning. The wildfire continues to blaze in the northern forests of Alberta, and conditions remain extreme. A province-wide fire ban is in place. NASA has released several photos of the wildfire’s smoke, which has drifted into the U.S., and seen as far as the Atlantic coast some 3,200 miles (5,000 km) away. As of Sunday May 8, there are more than 500 firefighters battling the blaze in the Fort McMurray region. They’re being assisted by 15 helicopters, 14 air tankers, and 88 other pieces of fire-fighting equipment. The fire is nearly 400,000 acres (161,000 hectares) in size, and it’s expected to grow. A total of 34 wildfires are burning, with at least five of them out of control.